Product Condition: The Defender Snowboard Binding is in Good condition. This item was previously owned for 3 weeks. The following observations were made concerning this item. 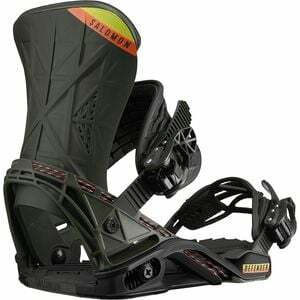 Backed by pow-shredding powerhouses Wolle Nyvelt and Josh Dirksen, the Salomon Defender Snowboard Binding has a stiff, supportive flex and response-maximizing tech to keep you in control when you're taking on technical terrain. The ShadowFit baseplate features a KEVLAR QuickWire heelcup, which replaces the traditional rigid heelcup with a flexible one that truly conforms to your boot when you crank down the straps, resulting in a downright psychic level of response. The canted footbed instantly injects some power into your pop, while the SCS + full EVA footbed soaks up harsh chatter at high speeds and impact from flat landings. Combine that with the powerful support and energy transfer of the Defender highback, and you have the intuitive control and enhanced response you need to take down the biggest lines and hairiest terrain your local range has to offer. QUESTION: what size boots will these fit for both men and womens? ANSWER: The size Small will fit US Men's 4-7 and US Women's 3-6. QUESTION: These fits smaller women's sizes than men's? Should it be the other way around? ANSWER: Our sincerest apologies for the mistake. It appears the sizing chart we were referencing is incorrect. Unfortunately, Salomon does not specify Women's sizing for these bindings, but the should be able to accommodate a Women's US boot roughly 1.5 sizes larger than a US Men's.